The Nikkei starter earn the win as Kansas City takes a 2 games to 1 lead over the Giants. SAN FRANCISCO —If Jeremy Guthrie was feeling the butterflies before his start on baseball’s biggest stage Friday, it certainly didn’t show in his performance. The Royals pitcher turned in a strong effort, getting into the sixth inning and winning his first World Series start, 3-2, and helping Kansas City take a two games to one lead in the fall classic. Guthrie, a native of Oregon, starred as a pitcher at nearby Stanford University, where he helped his team reach the final of the College World Series in 2001. He said the familiar Northern California surroundings weren’t much of a factor in his performance Friday, but he admitted that he pause before his first pitch, to absorb in the weight of the moment at the beginning of the game. Happiness, gratitude, excitement, are the terms Guthrie used to describe his feelings about playing in what has for generations been the most coveted event in American sports. 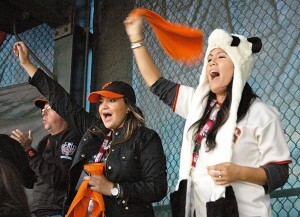 Clad in her furry panda cap and cheering on every pitch, San Francisco resident Hiroko Shirakata, right, and friend Andrea Valencia scored a pair a World Series tickets just prior to game time. With the Giants trailing late in Friday’s game, Shirakata hadn’t lost hope. “No worries, we’ll win,” she insisted. Returning to Northern California didn’t factor much in the night’s performance, he said, explaining that his goal was to take the approach he’s had all through the playoffs. Guthrie certainly seemed at ease on the mound, and even appeared to attempt to bunt for a hit in one at-bat, a bold move for an American League pitcher. “I’ve tried to do [my best]throughout these playoffs, because who knows, I might not get another chance,” he explained. “What you saw tonight is what I’ve seen from him for the last three years,” said Royals manager Ned Yost. He said after Guthrie gave up a run in the sixth inning to make the score 3-1 , he wasn’t going to hesitate to go to his relief staff, one that has been a huge factor in Kansas City making it into this World Series. “I wasn’t going to take any chances, not with the bullpen I’ve got,” Yost insisted. Statistics show the winner of the third game of the World Series has gone on to take the championship in roughly 70 percent of the previous Fall Classics. 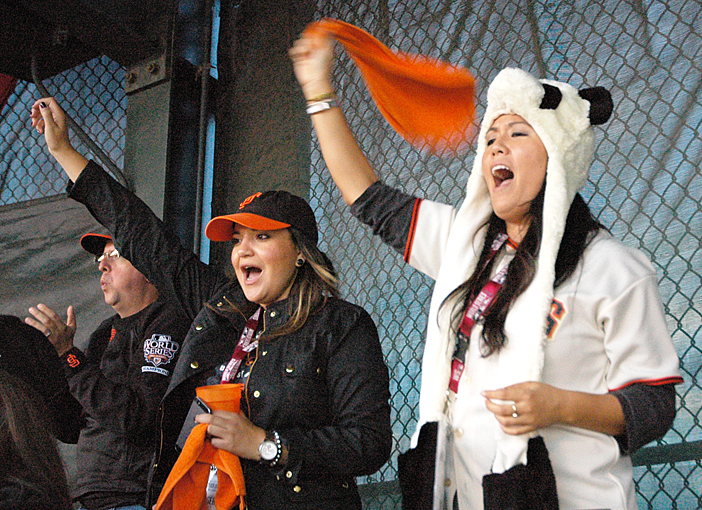 Game 4 gets under way just after 5 p.m. on Saturday at AT&T Park. He was a first-round draft pick of the Cleveland Indians in 2002, but his road to the big leagues included a point where he faced a major decision. At age 19, Guthrie, a dedicated Mormon and a student at BYU, left baseball and became a church missionary for two years. During that time, he said he never touched a glove or a baseball, and in a significant way, it may have been for the better. Guthrie, 35, was by no means a dominant pitcher this season, compiling a record of 13 wins and 11 losses, but he has been steady and effective when it counts most. His last playoff start came in the American League Championship Series, when he allowed just one run and three hits in defeating his former team, the Baltimore Orioles. 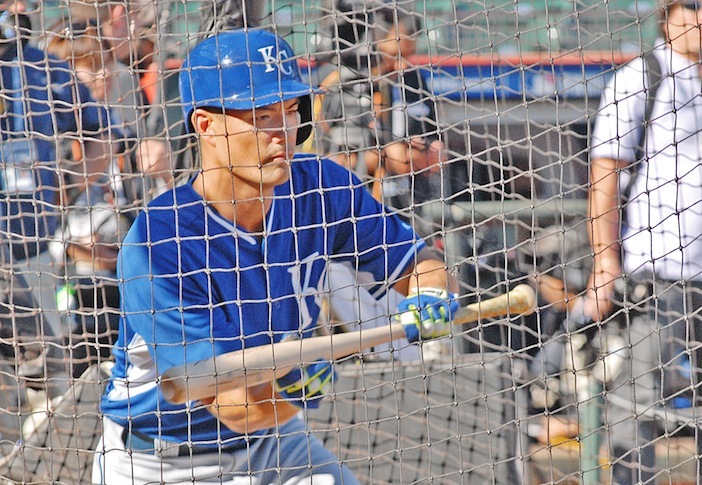 Yost said that off the mound, Guthrie is a leadership asset to the team. Fluent in Spanish, he helps bridge some cultural gaps in the clubhouse, and has been doing his best to bring Japanese outfielder Norichika Aoki into the fold. As is his custom, Guthrie invited several people to Friday’s World Series game, including some former Stanford coaches and the brother-in-law of an old pal. Perhaps familiar faces help to quell the butterflies in a game that ballplayers dream of their entire lives. Royals bench coach Don Wakamatsu also said he had family coming to the game, and figured the familiar surroundings put Guthrie at ease to some extent.